Infographic: How to write killer content people actually read and share! Writing a blog post can take hours. In fact, Copyblogger estimates that it takes their bloggers five to seven hours to complete a post, including researching, writing and editing. It definitely shows. Copyblogger gets an enormous amount of traffic. Their content is read, shared and re-shared over and over again. Still, there are studies that say many bloggers spend less than two hours on a piece. I’ve tried reading those blogs. It shows. Moral of the research, if you’re gong to spend time writing a blog make it count. 1.) Catchy / Compelling Headlines – With all the time you can spend producing great content, it can fall flat and go unnoticed if your headline is a yawner. Writing excellent content is just half the battle, in order to spread and grow traffic, articles demand a headline that catches the audience’s attention immediately. The piece needs to shout, “Hello! Look at me”, to do that it has to be intriguing, helpful, valuable and attention grabbing. Generally speaking; How to articles, Lists, Solution based, Secret formula (The secret to becoming a money magnet), and the Little known tactic (Little known ways to become a sought after expert), An article comprised of intriguing and valued information can easily go unread if the headline fails to draw the attention of its readers. According to Copyblogger, “On average, 8 out of 10 people will read your headline copy, but only 2 out of 10 will read the rest.” With numbers like these, you’ll want to spend time getting your headline just right before you even begin writing a piece of content. 2.) Use Visuals – With all of the blogs, sites, and articles floating around the web, viewers can easily get overwhelmed especially when the reading is – dare we say – boring, tedious or yawn – generic. Using a fresh, abstract approach to catch your audience’s attention can go a long way in driving readers to your site. Consider adding a video, slideshow or perhaps an infographic to illustrate the main points and stimulate interest. We live in a fast paced world, with information flying at us from many sources. There is a lot of noise out there so anything you can do to make your material interesting and easy to read will help you rise above the crowd. A point Dan Shewan and many other content writers understand is that viewers need their information to appear clearly and quickly in order to refrain from deterring viewers. Based off data by Tony Haile of Chartbeat, writers have just 15 seconds to capture readers’ attention. The ability to produce content that is easily and immediately able to capture the attention of its viewers and offers something of value is a great way to grow your email list without paying a dime. 4.) Guest Blogging – Guest blogging is great method that can quickly build awareness to your content and site. This option is not only free, but enables someone else to contribute new content to your site or blog. Guest blogging helps increase exposure by allowing others to contribute exciting, relevant content to your site as well as enabling you to do the same in return on someone else’s blog. A word of caution, when opening up your blog to guest blogging, be mindful that you will be bombarded with spam requests to guest post. You can control this by asking to see their current articles and having them submit posts directly to you rather than giving them access to upload content to your site. 5.) Social Media Engagement – If you have already taken care of the topics covered above and have an excellent blog or site with exceptional content, you’re ready to engage in social media. Producing great content is just a start, you have to share that content to truly get traffic to your site. Social media plays a major role in growing traffic because there are several channels that reach millions of users. One of these useful channels is Twitter. Dan Shewan of Wordstream mentions, “Twitter is ideal for short snappy links”. 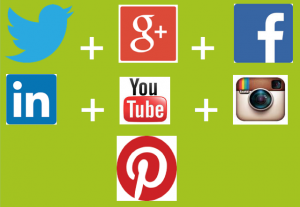 Additional social media platforms include Facebook, Googe+, Pinterest, YouTube, and LinkedIn. Harnessing the capabilities of these channels can be useful in stimulating various audiences. You need to make sure the content you post on these channels is relevant and new because your audience won’t hesitate to scroll past something old and unappealing. Simon Campbell of Shane Barker reveals that, “Making your blog a part of your overall network also means promoting your new posts when you put one up. Sending out Twitter shout-outs, posting status updates on Facebook, informing your groups on LinkedIn – these are all great ways to tell people that there’s a new post up”. When posting on social media, always make sure to link everything back to your website in order to grow traffic and spread awareness of your blog, and always include a call to action (CTA) in your content since the ultimate goal is to build your list. Social Media is all about engagement. It’s a great place to prospect but, just like off-line prospecting you have to work at creating a relationship. You can’t just expect to show up, post some content and leave. That would be like going to a networking event, handing out your cards and leaving. You have to participate in your groups, share useful, relevant content, not just your posts but other people’s content as well. You have to make an effort to consistently show up and engage with others. You now have several key starting points to get more visitors to your website. Utilizing this information will help you expand your business and build credibility within your industry. To help give you a complete step-by-step visual walkthrough of building and scaling your business online I put together this free 3-part training series. Most people, in fact most businesses are not aware of some of the simple steps that can make a huge impact on your business growth. Grab the Training Here and quickly learn how to get your business noticed!